Canada is a vast country, the second largest in terms of area (after Russia), and stretches across the entire North American continent. Canada's vast size is reflected in its cuisine, which includes many different regional dishes and recipes. Canada's cuisine derives from a number of different sources and historic associations. Historical influences from Britain and France, have of course influenced Canadian food, cultural exchange with the United States has been important too. Canadian cuisine also includes influences from German cuisine and eastern European cuisine (especially Polish cuisine). Additionally, some dishes, particularly those of western Canada, have been influenced by Scandinavian cuisine. Additionally, Canada has unique variety of Chinese food - including, mostly famously, the "Chinese smorgasbord", which is believed to have originated in Vancouver during the second half of the 19th century). Finally, it is worth noting that the Inuit and First Nations people have their own culinary traditions, and native American cuisine has also played an important part of the development of Canadian cuisine. Fish and brewis - This is a traditional meal that originates from Newfoundland. It is made using salted cod and hardtack, which is a savory cracker type biscuit made from flour. The fish and the hardtack are separately soaked over night. The following day, they are boiled (still separately), and then finally cooked together. Drawn butter (melted butter thickened with chopped onions and flour), or pork fat ("scrunchions"), are drizzled on the dish before eating. Flipper pie - Flipper pie is another traditional dish from Newfoundland, and is made from seal flipper. Ginger beef - Ginger beef is a Chinese-Canadian dish. It is particularly popular in western Canada. The dish is made by deep frying strips of beef, and coating these strips with a sweet sauce which is somewhat similar to Japanese teriyaki sauce). Jigg's dinner - From Newfoundland, Jigg's dinner is salt beef with cabbage, boiled potatoes, carrots and turnips. It is served accompanied with pease pudding (which is a paste made from baking peas). Lumberjack's breakfast - A huge and hearty breakfast supposedly eaten by Canadian lumberjacks. It consists of ham, bacon, sausage and eggs, as well as several pancakes. Montreal bagels - Montreal bagels are the Canadian version of bagels (Note: Many bakeries in Montreal are not certified as kosher). They are cooked by boiling in honey-sweetened water and then baking in a wood-fired oven. 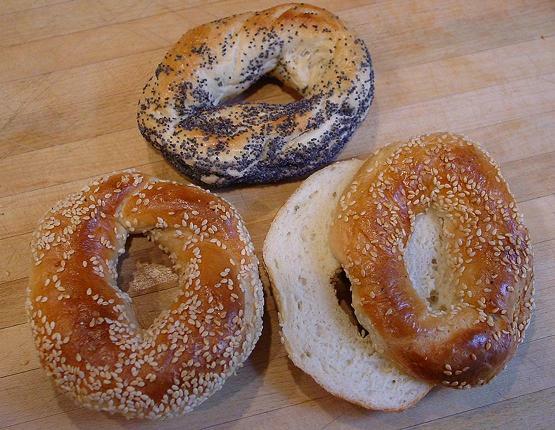 Canadian bagels are usually topped with sesame seeds ("white seeds") or poppyseeds ("black seed"). Oreilles de crisse - Deep fried pork jowls, served with maple syrup. Pâté chinois - This French-Canadian dish has been described as resembling shepherd's pie. It is made by covering a layer of ground beef (which also contains onions and peppers), with a layer of corn, which is in turn covered with a layer of mashed potatoes. The dish is often flavored by sprinkling the top with paprika, and is often served accompanied with with pickled beets. Poutine - French fries covered with cheese curds and covered with gravy. 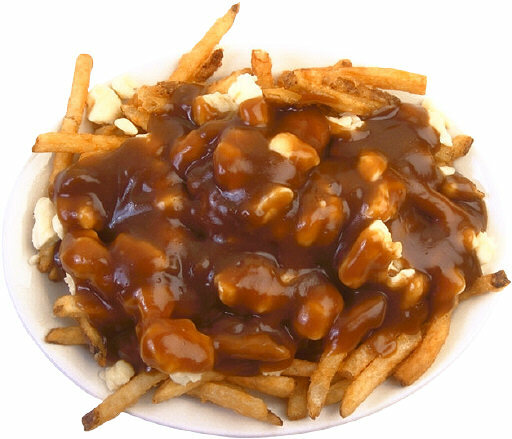 Poutine originates from Québec, but has become popular throughout Canada. Tourtière - Another dish originally from Québec. Tourtière is a meat pie, that is most often eat during the Christmas period. The pie contains using ground pork, beef or veal. Tourtière du Lac-Saint-Jean - A variation on the Tourtière meat pie, but containing diced game and potatoes. Butter tarts - A pastry shell containing butter, sugar and eggs. Other ingredients such as butterscotch, chocolate chips, dates or nuts are sometimes added. dates, chocolate chips, butterscotch, etc., may optionally be added. Figgy duff - A boiled pudding from Newfoundland. It is made by boiling butter, sugar, eggs and raisins in a bag. Nanaimo bar - A dessert made from three layers. At the bottom is a crumb layer (made from coconut, nuts and wafer crumbs), on top of this is a layer of vanilla custard, and this is topped by a layer of chocolate. Toutin - Also known as "Damper dogs" or "Damper devils", toutin is a Newfoundland dish, similar to pancakes, made by frying dough in fat. Rosie Daykin, founder of Butter Baked Goods and bestselling author of Butter Baked Goods and Butter Celebrates!, realized early on that her talent in life is feeding others. For her, cooking is a way of starting a conversation--a way of saying "thank you," "I love you," or simply "tell me about your day"--with something much tastier than just words. Rosie's cooking is as unfussy and straightforward as it is delicious and beautiful. Given how busy life can be, she doesn't believe making a comforting home cooked meal should make it any more complicated--because complicated doesn't always mean better. Let Me Feed You is a warm, humorous cookbook full of easy-to-follow recipes destined to become new favorites. It is a celebration of everyday life at home, filled with beautiful photography, funny stories, and Rosie's love of blue and white stripes. Let Me Feed You is the perfect gift for yourself, or for anyone in your life who has fed you, or loved you. Finally experience the foods from this classic children's series with The Anne of Green Gables Cookbook. Have you ever wanted to sneak a sip of Diana Barry’s Favorite Raspberry Cordial or try a slice of Anne Shirley’s Liniment Cake (without the liniment!)? Now you can, with the delightful teatime snacks, mains, desserts, and more created by Kate Macdonald, L.M. Montgomery’s granddaughter. through this helpful and informative guide. dietary benefits and help followers maintain a healthy lifestyle. Beginners and fitness professionals alike will benefit from the book’s 14-Day Beginner’s Guide to Intermittent Fasting. on track when fasting and dieting become a struggle. Take your baking from simple to sensational with Anna Olson's comprehensive guide to beautiful baked goods. Bake with Anna Olson features more than 125 recipes from her popular Food Network Canada show. From chocolate chip cookies to croquembouche, pumpkin pie to petits fours, Anna Olson's newest baking book is full of delectable delights for every occasion, category and skill level. Beginner bakers, dessert aficionados and fans of her show will find over 125 recipes to take their baking to the next level, whether through perfecting a classic like New York Cheesecake or mastering a fancy dessert like Chocolate Hazelnut Napoleon. Introductory sections on essential tools and ingredients explain how to prepare your kitchen for baking success, and Anna's helpful notes throughout point you towards perfecting key details for every creation. Recipes for cookies and bars, pies and tarts, cakes, pastries, and other desserts give bakers a range of ways to savor their sweet skills, with a chapter on sauces and decors to round out your knowledge, and a chapter on breads to practice your savory savoir-faire. Gorgeous photography illustrates each recipe and guides you through difficult techniques. Baking your way through Anna Olson's favorites couldn't be easier (or more delicious!). Whether you're looking for a classic baking recipe or a new baking challenge, Bake with Anna Olson is your new go-to baking book for all occasions! This is your final keto diet for beginners cookbook! If you have tried all the known fad diets out there, and none of them seem to work. If you’ve been trying to lose weight for any length of time, you may be worn out and tired of traditional diets. Any diet that requires you to starve and restrict yourself isn’t going to work, simply because it is impractical and difficult to stick to for any length of time. The keto diet is different – it’s not a diet at all but a healthy plan for eating. This diet holds the key to turning on your body’s fat-burning switch and it is the secret to weight loss that you’ve been looking for! But what is it all about? The foundation of the keto diet is a metabolic process called ketosis in which your body actually starts to burn your stored fat for fuel. All you have to do is change the way you eat to activate this switch and to start losing fat fast. It’s surprisingly easy, especially with this book in hand! On top of all of this, you’ll also receive a collection of 70 delicious keto diet recipes, each made with just 6 main ingredients or less. With the help of this book, you’ll find that following the ketogenic diet is easy and you’ll start seeing results sooner than you thought possible. Good luck! Click - The BUY NOW Button At The Top Of The Page!